Sydney Norvell and family celebrate after she signs her letter. 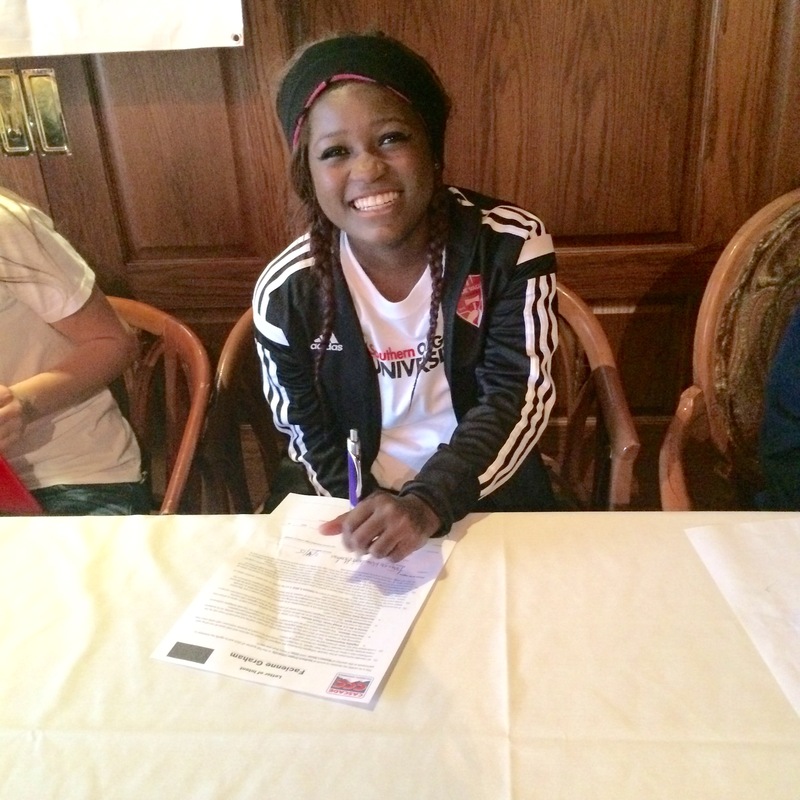 Ashland High School senior, Facienne Guerlanda Graham, signed her National Letter of Intent to play soccer for the Southern Oregon University (SOU) Raiders. SOU was never in Graham’s plan, she always wanted to go to California and not stay close to home, but when SOU started looking at her during her senior season, Graham toured the NAIA school and realized that with college funding money, and her sudden wish to stay closer to home, it actually could be a good fit. “I wanted to start by taking a small leap, rather than a huge leap,” Graham said about her choice of SOU. She has already started playing indoor “futsal” with them and hopes to be playing on their first team as a freshman. SOU Women’s Soccer went 5-10-2 (Win-Loss-Tie) overall and 4-4-1 in conference during their 2014 season. The Raiders also scored an impressive total of 22 goals. Graham’s speed and precision should fit well and help the team to more victories in the 2015 season. Graham has always been an avid soccer player since she moved to Ashland from Haiti in elementary school. She attended Phoenix High School her junior year, but came back to finish out her education in the town she calls home. Facie Graham signing her letter of intent. Ashland High School has another senior headed to Southern Oregon University. Sydney Norvell signed April 10, 2015 to wrestle for SOU’s new women’s wrestling team. 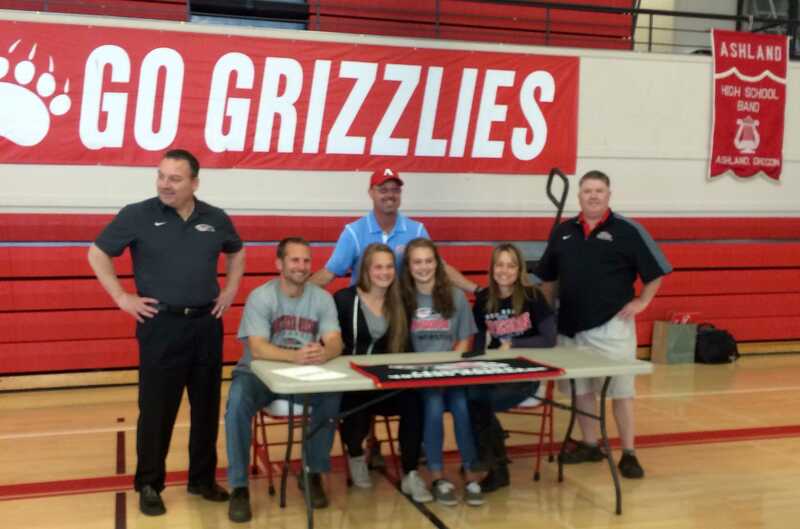 She is the first female wrestler to sign at SOU. The school started recruiting Norvell two weeks before this year’s State Wrestling Championships, where Norvell took first place for her weight division. Originally Norvell was planning on attending the University of Oregon, but changed her mind because of her success in wrestling. “I chose SOU because I wanted to challenge myself and be a part of a women’s wrestling program,” Norvell said about her choice to attend SOU. Norvell has always been quite athletic, she was a champion gymnast until halfway through high school, when she decided to try out for the soccer and wrestling teams. She played goalie for the varsity soccer team and was the first girl to join the AHS wrestling team. Norvell plans to live in SOU’s newly built dorms and will begin spring training next week. There is no doubt that Norvell will become an integral part of the new SOU Women’s Wrestling team and Ashland High School cannot wait to see her thrive.